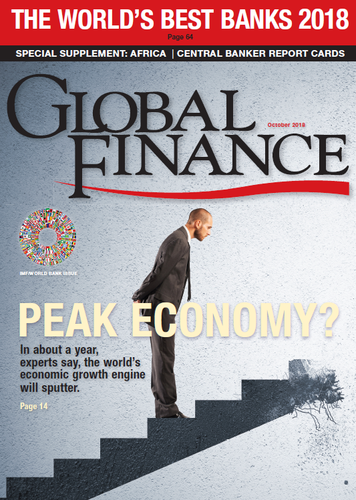 Global Finance: What are the main economic and financial challenges in Libya today? Saddek Elkaber: The key challenges Libya is facing today are driven by the political, economic and security conditions prevailing in the country since 2013, in addition to the external environment affecting international oil prices. Together, these conditions have generated significant macroeconomic volatility, amplified existing structural distortions and created policy uncertainty. Libya is heavily dependent on the hydrocarbon sector. The collapse of production in 2013 (due to politically driven stoppages and fighting), followed by the 2014 drop in international oil prices, reduced government revenues from $53.2 billion in 2012 to $4.6 billion in 2016. These twin shocks led to sharp increases in the budget and balance-of-payments deficits in 2014–2017, putting immense pressures on our international reserves and the fixed exchange rate. Meanwhile, the political divisions in the country, which led to the fragmentation of state institutions—including the fiscal and monetary authorities—prevented the adoption of adequate policies to deal with these shocks. This affected our citizens’ standards of living as the people faced inflation, shortages and a liquidity crisis. The 2017 rebound in production and prices has had a positive fiscal impact. However, continued uncertainty over security and policymaking remains an obstacle for economic recovery. GF: Looking at the region, what are your main concerns? Elkaber: Libya has porous borders and weak government institutions, but at the same time it stands in a strategic location and is relatively wealthy. As a result, the country is very sensitive to the economic and political developments in Africa and the Middle East. The growth of illegal immigration to Europe and the proliferation of smuggling networks between Libya and its neighbors is a big topic. Another concern is the ability violent groups have to exploit the country’s instability to further undermine domestic and regional security. Our neighbors in Europe, Africa and the Middle East should have a direct interest and play a more prominent role in supporting the return of security and stability to Libya. At the moment, the response has been inadequate given the magnitude of challenges we face. In a few cases, intervention in our internal affairs by neighboring countries has further aggravated the situation. More generally, we are concerned by rising geopolitical volatility and insecurity in the Middle East, as it has a negative impact on the prospects for economic integration and investment flows. GF: What is Libya’s position in the global economy now? What are your perspectives? Elkaber: Despite its challenging political and economic circumstances over the past seven years, Libya has a strong potential to achieve political stability and economic prosperity in the future. The country’s vast and underdeveloped hydrocarbon resources combined with its proximity to oil and gas markets provide it with a great incentive to attract foreign capital and expertise. Post-conflict reconstruction needs should also make Libya attractive for international companies operating in the infrastructure and construction sectors. With limited diversification in the past and the pressures of a growing population, the country needs to modernize its service sectors including health, education and the banking system.